Alloy wheel repair in melbourne can fix all sorts of wheel damage , including fixing and repair of gutter rash, scratches, faded paint on wheels, alloy wheels that have been gashed, grazed , chipped or badly damaged will require a unique quote. Today we repaired some Enkei wheels, there were 3 18inch wheels with low profile tyres. There was severe scratches and guitter rash on each wheel. We first removed the wheels from the car by raising the vehicle onto jack stands. We cleaned all 3 wheels using wax and grease remover and car shampoo to prepare the wheels for repair and restoration. We started by machine sanding the wheels, we have 2 types of machine sanders we use when repairing alloy wheels. The first is a larger random orbital sander with a 5" disk and the other is a very compact air tool orbital sander for getting into tighter areas. We removed all gutter rash by first sanding with 400 gritt then moving to 800 grit and wet sanding with 1200 grit sandpaper. Once the alloy wheel surface was ready we prepared them with a light primer and colour matched the paint using our large colour fan. We blended the correct colour back into the wheel and made sure that there was no colour variation on each wheel. Finally and to complete the alloy wheel repair we added a protective gloss coat to the finish and cured this with an infrared uv heat treatment. The end result was fantastic and fully repaired set of alloy wheels. Another alloy wheel repair success story. Wheel buddy in melbourne has just joined forces with the pre sales repair group which services car yards and auto traders. PRG group provides on site panel repair, wheel repair and a range of services such as exterior detailing, dent removal and others. Wheel buddy prides itself on customer service, our goal is to provide a quality premium service to auto enthusiasts. We love cars, cars are our passion and we strive to improve our process and results as we grow. We got into wheel repair through growing up and modifying cars , performing odd tasks such as installing suspension, servicing our cars , installing stereos , changing wheels , painting calipers , fixing body work , engine components , this was back in the days of the carburettor and the first car we did work on was a VK Commodore some 13 years ago. 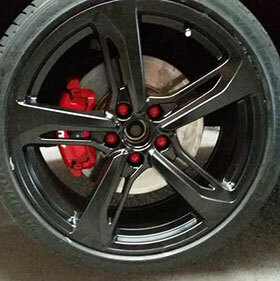 Wheel Buddy was started after Easy Calipers which is a caliper painting service, we felt that wheel repair was a natural comliment to caliper painting and it made sense to start Wheel Buddy in Melbourne. We repair gutter rash on-site in melbourne. We remove gutter rash by sanding it out and then painting the area or sometimes painting the whole wheel which is being repaired. Matching the colour for repairing alloy wheels is a matter of knowledge and practice. 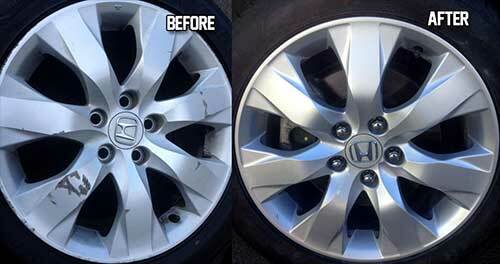 This page is dedicated to Images we take after we repair alloy wheels.